My friend Charlie Page has put together this brief, but very good overview of paid online traffic. You can see this post and many others that may help your online marketing at www.charliepage.com. Although the following paid traffic information is most useful for internet marketers, many of the same ideas apply to Insurance Agent Marketing. Enjoy! 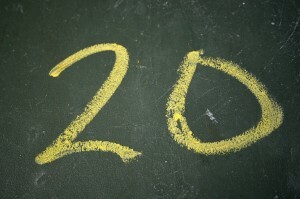 In a previous post we discussed 22 ways to get free traffic. At the end of the day we all have the same choices when it comes to traffic – we earn it or we buy it. Smart marketers do both continually by doing things like building their list from the traffic they get from sources like paid advertising. That’s a smart tactic that creates true marketing leverage. It creates leverage because having your own list is perhaps the #1 key to succeeding online. This is why you often hear experienced marketers say they always drive traffic to a squeeze page and not a sales letter. They want to build their list and then send the visitor to the sales letter, knowing that some people will just leave and they might lose a bit of business. But the prospects they gain are much more interested and likely to buy. This is one sure way to increase conversion. But let’s save that for another article! Today let’s take the big picture look at paid traffic, just like we did with free traffic methods. If you want to know more about each please visit my post Free Traffic: 22 Methods That Really Work. The major difference between free and paid traffic is that when earning free traffic you are doing the work but with paid traffic you are buying ads on places where others do the work. For example: You might notice that forums are on both lists. 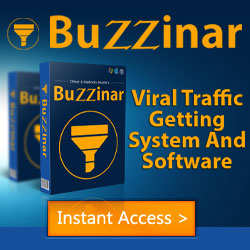 For free traffic from forums you need to spend time participating. To get paid traffic from forums you simply buy ads on the the forum itself (most offer advertising) and you can skip all the time it takes to post and participate. It’s still a good idea to participate but with paid advertising it’s not necessary at all. Now let’s look at the big picture of the paid traffic world. 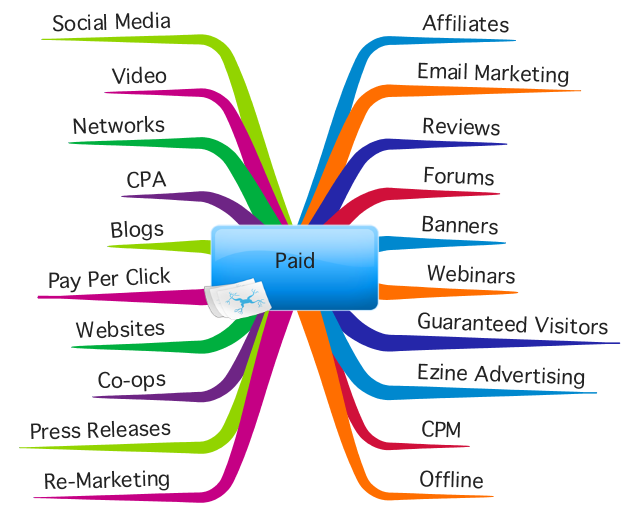 First, here’s a little mind map I drew for you about paid traffic. As before, you can ignore this if you are not into graphical thinking or mind maps. Now on with the show! Rather than grouping them by publishing or broadcasting or collaboration I thought it might be more useful to list them and then share a short insight about each. Running your own affiliate program can be a dream come true. It’s no guarantee of success however since affiliates can misrepresent your product and cause you headaches. Believe me, I know. But if you develop a strong army of affiliates and work with them to promote your product for a commission you won’t have to worry about traffic again. Jimmy Brown has famously said that his affiliates send him all the traffic he needs, and I believe him. Email marketing and ezine advertising are similar but a bit different. The difference is that there are companies with very large lists that will sell you solo ads but they don’t publish an actual email newsletter. These companies range from the very large to smaller players, so you need to know who you are buying from and avoid spam complaints. But solo ad sends to these lists can work very well. Many large sites, often blogs, will sell you a review on their site. The costs and effectiveness varies, and these site owners won’t fib and say a product is great if it’s not in most cases. Getting a paid review amounts to an endorsement in most people’s eyes, so the value here can be huge. Find a top blog or site in your niche and see if they offer a paid review. Many forums sell advertising space on their forum site. This is highly targeted advertising, especially if the forum you choose will let you buy ads on a sub forum. These ads are usually banners but they can take other forms as well. Some forums will even send email for you to their registered members. Not sure why people don’t use banners more often but they should. A well-placed banner can bring in huge results, and the costs are quite low. Banners are often sold on a cost-per-thousand impressions basis so it’s very important to know where the site gets its traffic. If you target correctly, and if your banner creates intense curiosity, you can do very well for a low fee. There are a few ways to pay and get traffic with webinars. You can host them of course, but that’s hard for most people. Some webinar hosts will actually sells ads that show during the webinar. I know of no clearinghouse for this but there should be one. I predict this will become a big trend. Another way to use webinars is to pay someone to host a webinar for you. This is best done as a joint venture but can work well. While I’m not a fan of guaranteed visitor programs (the traffic is usually of very low quality) there are situations where some reputable suppliers can send traffic that will help you. I personally believe this is best only for list building. Let them join your list first so you can sell them later and then send them on to the sales page. This is one of my favorites, not because I own the Directory of Ezines or because I publish an ezine but because it just works so well. When you match the product you are promoting to the interests of the readers of the ezine very good things happen. It’s vital to pay attention to this prospect matching idea when doing any form of advertising. Simply put, you pay for every 1000 impressions (or times you ad is shown). While some use the term CPM differently, it began as a way to express cost-per-thousand and is still used that way today. CPM advertising can be very profitable and is excellent for list building. So many online marketers overlook offline methods completely. That can be a mistake. The key with using an offline/online mix is to either create curiosity in your offline ad or pre-qualiy a reader or listener and then drive them to a site where they can take the next step. Social sites like Twitter and Facebook can be fun and profitable both. They can also be hugely time consuming. So why not skip the hard work and just buy ads on the sites? While this is very limited with Twitter as I write this, Facebook and other social sites like Digg do offer on-site ads that work well. Not ready to shoot your own video? How about buying ad space on videos about the topic you want to promote? YouTube had offered this for some time and other video networks are getting on board. The key here, as with most advertising, is to create curiosity and interest, not try to close the sale. Ad networks can be huge time savers if you have a larger budget. Many ad networks let you get started for only a few hundred dollars (others start at $10,000 or more) and they can place all sorts of ads for you on all sorts of websites. Highly targeted and you can control costs too. I heard the founder of a large technology company say the other day that Cost Per Action was going to be the only model in the near future. While that might be overstating it, CPA can be a wonderful way to get new clients while controlling costs. For example, if you know a customer is worth $100 to you and your conversion is high you can afford to spend enough to really zero in on your target market. Since you are not paying for tire-kickers you can feel sure your money is well spent. Many blogs accept advertising right on their site. Blogs often offer banner ads, in-post ads and more. Some blogs will email their list for a fee or, as mentioned above, do paid reviews. Identifying top blogs in your niche and following them makes good sense. Here is my favorite blog. Pay per click has gone through many changes. Affiliate friendly at first, many PPC providers turned on affiliates with a vengeance. Added to this is Google’s habit of canceling accounts without any notice or recourse and you can see why many feel PPC is not an option. But it can be if you do it well. My favorite voice in this world is Perry Marshall. Advertising directly on almost any site you want can be done with Google AdWords. Many people don’t realize they can target a specific site but it can be done. It is often easier to use an ad network for this however. Another option, take a look at a site you want to advertise on and look for an “advertise” link at the bottom of the page. Some physical product companies offer what is called co-op advertising. This is where the company rewards you for sales by purchasing advertising for you. While this does not apply to any online products I know of, if you are marketing a physical product online then ask the company about their co-op program. Press releases are great if you have something that is actually news-worthly. Unfortunately, press releases are often taught as a good traffic-getting strategy by people who have never used them. They sound good, and are easy to do, but in my view don’t work for most people and should be avoided. Remember this when doing a press release – the people reading your release will mostly be reporters looking for a juicy or otherwise attention grabbing story. So be sure to give them one if you can do that ethically. Re-marketing works well but most don’t know about it. Here’s how it works. You set up a RM campaign and when someone visits your site (this works best for site owners) a cookie is set. Now when that visitor goes to a website that is within the network of sites your re-marketing company works with your ad is shown to that visitor, in essence reminding them you want them to come back to your site. There you have it – a view from outer space at the big picture of paid advertising. Sorry it’s long but there was a lot to say! In future posts we will dig deeper into each of these methods. Hope you enjoyed it. Please do leave a comment below or share with your friends on the social networks. Happily married for 39 years, Charlie is the dad to two wonderful daughters. He is the author of 10 books on Internet marketing and owner of The Directory of Ezines, Follow Up Selling Systems, Common Sense Blog Blueprintand other membership sites.